Waltham, Mass. — Simpson Gumpertz & Heger (SGH) received two Grand Awards in the American Council of Engineering Companies (ACEC) Engineering Excellence Awards national competition for the Bahá’í Temple of South America and the John W. Olver Design Building at University of Massachusetts (UMass) Amherst. 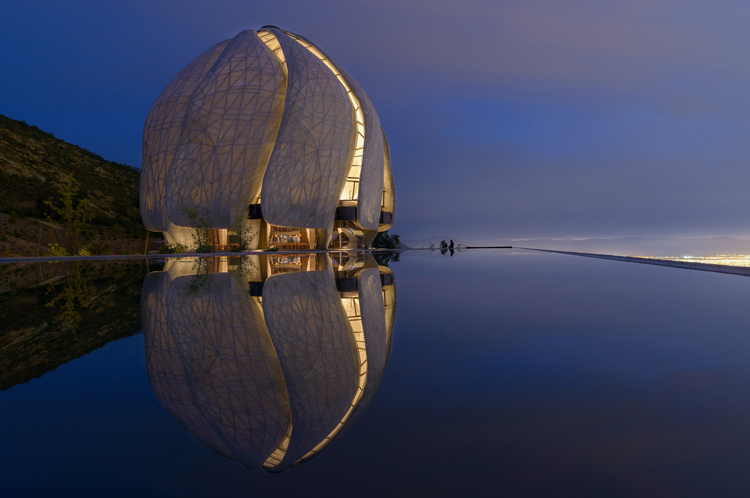 Working with Hariri Pontarini Architects, SGH helped to create the Bahá’í Temple of South America, a “temple of light,” in Santiago, Chile. The temple features nine wing-shaped, translucent petals that meet in a central oculus, allowing visitors to stand in the middle of the space and look up as if gazing through a canopy of trees to the heavens. The petals are clad with an innovative form of cast glass on the exterior surfaces and marble on interior surfaces, which let in the sun during the day and glow serenely in the evening. Located in the foothills of the Andes Mountains, the structure also rests on bearings that protect it from earthquakes in this highly active seismic zone. Team members include Halcrow Engineering, Patricio Bertholet, and Josef Gartner GmbH. The John W. Olver Design Building, designed by Leers Weinzapfel Associates, brings UMass Amherst’s Architecture, Landscape Architecture and Regional Planning, and Building and Construction Technology design programs together in a structure that exemplifies a focus on sustainable construction practices. A steel- or concrete-framed structure would be the conventional choice for this building’s size and use, but the Design Building features a timber-framed superstructure to maximize renewable materials. The exposed wood structure also emphasizes the system’s contribution to the building’s design while complementing and influencing its interior and exterior aesthetics. Team members include the UMass Building Authority, Suffolk Construction, and Equilibrium Consulting.